When searching for photos of Sombrero Light (re. Welcome to Mararthon) I found this, another Sombrero light station that had two towers with foundation legs but the towers gone for having been damaged and destroyed by storms. This light station is on Sombrero Island in the Leeward Islands. It is low and often entirely over-washed by hurricane seas. The current light was constructed in 2001. 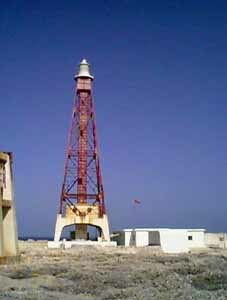 The 1962 light tower was of a somewhat similiar style of construction as the Florida Sombrero light. The last one has particularly long legs. Interesting finds, Tiny. Norway, eh ? Eerie photos of the Sombrero light station, with the two bases scoured of the lights which used to top them, Island. Some great photos, all around. Sombrero Island is about 80 acres and with elevation ranging from 10 to 40 feet.